While we're still waiting for IM+ to be approved and pop up in the App Store, AIM for iPad by AOL is ready and free in the App Store. 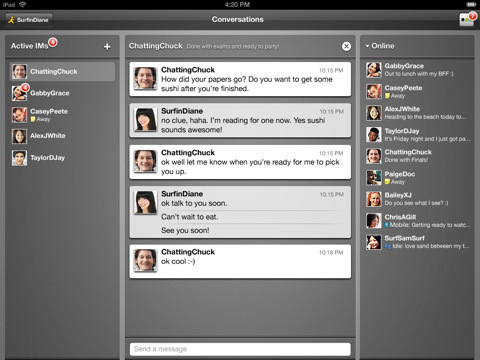 It supports geo location, Facebook updates and chat, MySpace, Twitter, Youtube, Foursquare and many others. Built from the ground up for the iPad, the app looks good from the screenshot we have, but it turns out you can further customize the appearance by selecting a custom background.I'm not sure whether you'd like to do so. The application also supports multi-accounts.